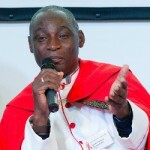 Reverend Canon Gideon Byamugisha (born 1959) is an Anglican priest in Uganda who heads a Faith Inspired Organization outside of Kampala called "Friends Of Canon Gideon Foundation (FOCAGIFO). In 1992, he became the first religious leader in Africa to publicly announce that he was HIV positive. In 2009, Byamugisha received the 26th annual Niwano Peace Prize "in recognition of his work to uphold the dignity and human rights of people living with HIV/AIDS". Byamugisha co-founded the African Network of Religious Leaders Living with and Personally Affected HIV and Aids (ANERELA+) in February 2002, and in 2006 started an Institute for holistic education, integrated training and youth empowerment -targeting especially AIDS orphaned and other vulnerable youths. He lives with his wife and three HIV negative children.